When I first saw the BIC Triumph 537RT, I assumed that BIC just took its Triumph 537R pen, added a retracting mechanism, tacked a “T” onto the end of the name, and called it a day. After all, it would have still been an improvement because the worst part about the 537R was its cap. 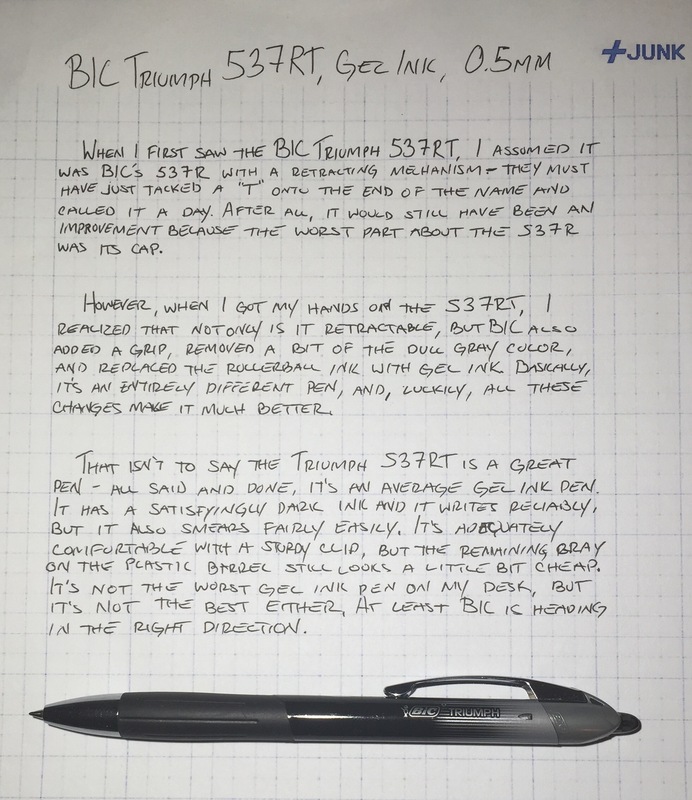 However, when I got my hands on the Triumph 537RT, I realized that not only is it retractable, but BIC also added a grip, removed a bit of the dull gray color, and replaced the rollerball ink with gel ink. It’s practically a different pen altogether, and, luckily, all these changes make it much better. That isn’t to say the Triumph 537RT is a great pen – all said and done, it’s an average gel ink pen. It has a satisfyingly dark ink and it writes reliably, but it also smears fairly easily. It’s adequately comfortable with a sturdy clip, but the remaining gray on the plastic barrel still looks a little cheap. It’s not the worst gel ink pen on my desk, but it’s not the best either. At least BIC is heading in the right direction.